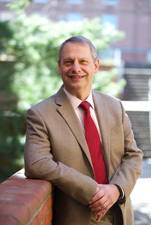 Rear Admiral (retired) Boris D. Lushniak, MD, MPH, has been Dean of the School of Public Health at the University of Maryland since January 2017 after serving as Department Chair of Preventive Medicine and Professor of Dermatology at the Uniformed Services University. He was the US Deputy Surgeon General (SG) from 2010-15, Acting SG from 2013-14 and was responsible for the 50th Anniversary SG’s Report on Smoking and Health and the SG Call to Action to Prevent Skin Cancer. During the ebola response in 2015 he commanded the US Public Health Service (USPHS) Monrovia Medical Unit in Liberia. He attended Northwestern (BS 1981, MD 1983) and Harvard (MPH 1984) and completed residencies in family medicine and dermatology and is certified in dermatology and preventive medicine (occupational). He began his USPHS career in 1988 in the Epidemic Intelligence Service and served with NIOSH until 2004 and was part of the team at Ground Zero and the CDC anthrax team. In 2004 he transitioned to the FDA in the Office of Counterterrorism and was appointed FDA Assistant Commissioner in 2005. He retired from the USPHS in 2015 as a two-star Rear Admiral after 27 years in the uniformed services.